Pinellas Sheriff Bob Gaultieri announces his decision not to make an arrest in a shooting near Clearwater. Florida's controversial Stand Your Ground law has come into play again after an unarmed man was shot to death outside a convenience store in Clearwater on Friday. Community members held a vigil and a protest Sunday and are demanding justice. A video taken outside the Circle A Food Store at 1201 Sunset Point Road near Clearwater shows Michael Drejka, 47, approach the car of Britney Jacobs, who was parked in a handicapped spot. The two are arguing when Jacobs’ boyfriend Markeis McGlockton, 28, exits the store and pushes Drejka to the ground. Drejka then pulls out his handgun and shoots McGlockton in the chest. 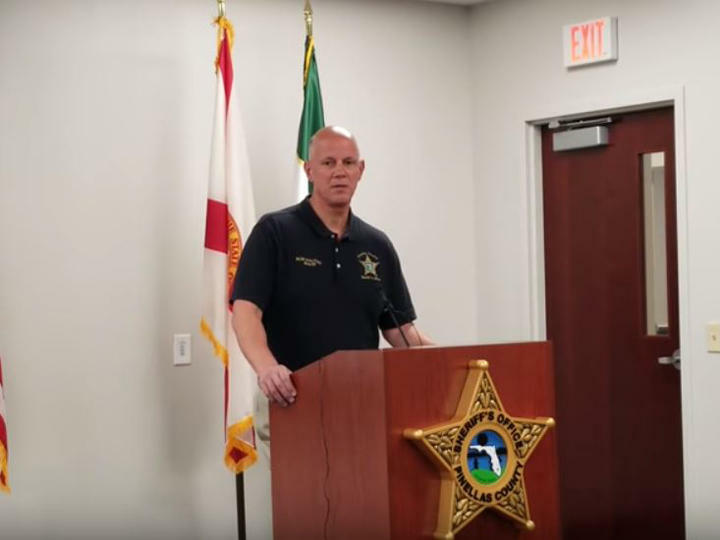 After investigating, Pinellas County Sheriff Bob Gualtieri said the Stand Your Ground law prevented his office from pressing charges. However, the NAACP continues to call for Drejka's arrest. McWhite says Drejka took advantage of the law. “He thought he saw some loopholes in the so-called stand your ground law, that he could do anything that he wanted to do including kill someone,” McWhite said. The law allows the use of deadly force when a person is in fear for his or her life. But McWhite says the law should not protect a person who goes looking for a fight. That’s what Drejka was doing when he confronted Jacobs, she said. Also, McWhite said Friday was not the first time Drejka has confronted someone over a parking space. “It was unnecessary, it was uncalled for and parking in a handicapped space, it doesn't fit the outcome,” she said. The Pinellas/Pasco State Attorney's Office is reviewing the case.